A good way of restricting access to different areas on your vTiger website is to create different profiles. You can specify the actions, available modules and features for a particular profile and restrict access to others for it as well. Then, you can assign a profile to a particular role on your website. When you do so, the available actions for the profile will be applied to all users in that role. To create a new profile on your vTiger website, you need to log into your website as administrator. Navigate to the Settings icon and then CRM Settings. Locate the Users & Access Control section and then click on the Profiles service. Click on the Add Profile button to create one. Description - Enter a short description for the new profile. 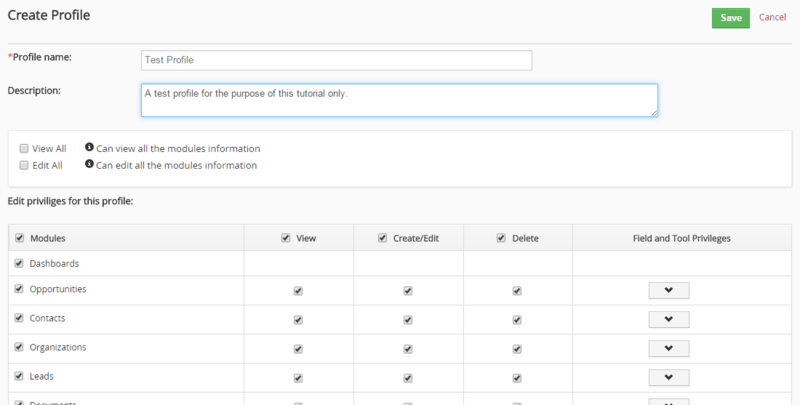 This step will allow you to set specific permissions to the profile for each of the modules on your website. Click on the Finish button to keep the changes on your new profile.